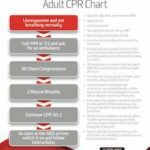 We have redesigned our CPR handouts and also increased the quality so they can be made in to posters. They are free to download and print. We have also added them to our online resources shop where you can buy them in paper format in A2 or A2 laminated. You can visit this site by clicking here. You can also from this link buy printed copies of our books. These handouts are available to all your students from the student resources section. There are 4 versions, adult, child infant and a healthcare professional version.